When I like a movie, I like to read the "making of" book that's generally released with it. They're usually pretty glossy, with lots of picture behind and in front of the scenes, with anecdotes from the cast and crew about what it was like to be filming the movie (or TV show). I probably haven't learned enough from these books to go make a blockbuster of my own, but I have learned something about the movie biz. Mainly, though, I read them because--for me--it's a way to prolong the enjoyment of the movie during that period between the theater and the DVD release.That being said, my son--knowing my proclivity for such books--bought this book for me for my birthday (which happened to be the day we went to see the movie "The Hobbit") and I started it immediately, reading it in the car as we're an hour from a movie theater. This had all those things I like in a "making of" book, and was well written. The author, Brian Sibley, is well known to many of us Tolkien fans as the man who wrote the scripts for "The Lord of the Rings" radio drama that was released on the BBC years ago, so his knowledge of Tolkien and hobbits is well established.One thing this particular book didn't have that I found refreshing was the "battle chapter". All books about the making of a major studio movie have a requisite chapter about the difficulties of getting the movie green-lighted. They follow a similar pattern of "no one believed in the project" and "it was going to be too expensive" but, eventually, the director or producer finds someone in the studio office who becomes a champion for the project and, praise be, the movie gets made in spite of the luddites and trolls who work for studios and, apparently, have it as their life's goal to see that no good movies are made.Following the success of "The Lord of the Rings" there was no such problem with "The Hobbit". There were a few minor difficulties, like finding the right director and deciding which studio actually owned the rights, but there was never any doubt that the studios couldn't wait to throw buckets of money at this project.I love going to movies and watching TV, and I like reading these books, but I don't think I would like being in "the biz". The idea of spending two days to film 8 seconds of screen time would drive me nuts. So I'll just enjoy the end product--and these books about how they got there. I have all the LotR movie guides and behind the scenes books, so it was a given I would get the ones for the Hobbit! Brian did such a great job on the LotR I figured no problems here, and that was correct. Really enjoyed reading the anecdotes and info from the production, and thoughts from the actors, director, producers, etc. Looks like a lot more Green Screen environments which was interesting to see. As this is now a trilogy, looks like I will have 2 more matching volumes to get in the future. One thing I liked, they spread the 13 dwarf segments out across the entire book, so you didn't have like, 50 pages of dwarf only reading which might have gotten old. This kept it fresh for me. Dieses Buch ist definitiv ein Must-Have für jeden Hobbit-Fan. Die vielen tollen Fotos und die Erzählungen rund um das Set, die Schauspieler und die Aufnahmetechnik ermöglichen einen tiefen Einblick in die Welt des Hobbit. Mit dem tiefen Verständnis, welches dieses Buch einem vermittelt, freue ich mich schon sehr auf den dritten und abschliessenden Teil der Hobbit-Trilogie. I think this is the first time I've read a book like this cover to cover. I've seen the movie twice now and love it (of course), and this book was a great companion piece. It delves deeper into both the characters and the technical aspects of the movie-making process. Very cool! It made me want to see it again!! !Loved getting to see the make-up artists at work, hobbit feet and orcs! The only reason it didn't get a 5...was because the sets took some of the magic away. Those places should be real! :) Fun read...great pics. This is a behind-the-scenes guide to the first installment of The Hobbit. I enjoy learning about the costuming and getting the actors point of view on various things. This was well done and fed my frenzy to know more about how the movie was made and who was in it. An excellent book for anyone who enjoyed pt 1 of The Hobbit movie. Some great photos, very interesting information and a highly enjoyable read overall. Beautiful pictures matched with fantastic interviews make this guide a perfect companion to the movie. Sibley is a fan who knows his lore and it shows. Awesome :) some great facts too (like that I'm exactly the same height as Bilbo) but had to knock a star off...two films?!?! It's three!! The 'official' movie guide should get it right lol! Amazing details that really add depth to the watching of my fave film of this year, superb book and such coverage!! The journey of Frodo Baggins and Gandalf the gray, joined by elves and dwarves who are sworn enemies but agree to unite to defeat a dragon who has been burning villages across middle earth. Frodo has never ventured outside of Bag End, hobbits don't go on adventures, or do anything that leads away from their homeland. A knock at the door finds him face to face with an Elf asking if any of the others have arrived yet? Frodo has no idea what he's talking about, what others? Another knock and another, soon Frodo's quaint little hobbit home is filled with Elves and Dwarves and awaiting Gandalf to explain it all. Poor Frodo is beside himself with concern, these beings are eating him out of house and home, making a huge mess while they are eating his best food and drinking his best wine, not to mention smoking his pipe weed. This tale will take you on a great adventure. A journey to faraway lands and treasures beyond belief.There are battles to be won and treasure to be found. Frodo is included because it is rumored he is the greatest of thieves. Truly one of the best books ever written. We lost a great storyteller when J R R Tolkien went to the other side. I never read this as a child but was recommended it as an adult. Having friend that read are a true blessing, one blessed me with The Hobbit. Der Hobbit - Eine unerwartete Reise. Das offizielle Filmbuch von Brian Sibley, erschienen im Klett-Cotta Verlag, beschäftigt sich mit allen möglichen Details rund um die Entstehungsgeschichte des ersten Hobbit-Films der kommenden Trilogie von Peter Jackson. Neben unglaublich vielen und schönen Bildern von den Sets wird in diesem Begleitbuch auch ein besonderes Augenmerk auf die Darsteller gelegt, wodurch man diese besser kennenlernt, ihre bisherigen Karrierewege erfährt und ihre Gründe, Teil dieses Films werden zu wollen, versteht. So lernt man unter anderen die Schauspieler Martin Freeman (Bilbo Beutlin), Richard Armitage (Thorin Eichenschild) oder John Callen (Oin) kennen, erfährt, dass die Zwerge Balin und Ori bereits im Herrn der Ringe Teil die Gefährten aufgetaucht sind (wenn auch nur als Skelette in Moria) und dass einige der Zwergen-Darsteller auch in die Rolle der Trolle geschlüpft sind.Das Gute an diesem Buch ist aber auch ein Schwerpunkt auf den Akteuren welche hinter der Kamera agieren, so lernt man Alan Lee und John Howe kennen, welche für die Skizzen verantwortlich sind oder Liz Mullane und Miranda Rivers, welche sich um das Casting gekümmert haben. Es ist sehr beeindruckend zu sehen und indirekt mitzuerleben, wie ein so gewaltiges Projekt umgesetzt wird und welch großer Aufwand in so einem Film steckt, seien es die neuen und innovativen künstlichen Silikon-Körperteile, die unglaublich toll inszenierten Kulissen, Fakten über Größenverhältnisse von den Filmsets oder das Motion-Capture Verfahren.Darüber hinaus lernt man noch jede Menge interessante Hintergrundinformationen kennen. So wusste ich bisher nicht, dass es von jedem Zwerg vier Double gegeben hat und das oft wirklich scharfe Waffen beim Dreh verwendet wurden.Ein unglaubliches Buch was bis zum Rand voll mit wunderbaren Informationen ist.Leider sind mir relativ oft Buchstabendreher (Adain statt Aidan), doppelte Worte oder veraltete Tatsachen aufgefallen, welche mich gestört haben, so ist bspw. auf S. 79 die Rede von "Beide(n) Filme(n)", dabei ist schon längere Zeit bekannt das es eine Trilogie wird oder auf S. 127, wo die Rede von "Elfen" und nicht von "Elben" ist. Diese groben Fehler führen leider zum Punktabzug und schmälern den ansonsten durchweg positiven Gesamteindruck dieses tollen Begleitbuches zum Hobbit-Film.Fazit:Wer die vielen Produktionsvideos zur Entstehung der Hobbit-Filme gesehen hat, wird sich in diesem Buch sofort sehr wohl fühlen aber auch alle anderen, die sich für Informationen zur Entstehungsgeschichte eines so umfangreichen Filmprojektes interessieren und über einige Rechtschreibfehler hinwegsehen können, sollten hier unbedingt zuschlagen. Ein nahezu perfektes Buch mit unglaublich vielen interessanten und verblüffenden Informationen. Ich freue schon jetzt auf den zweiten Band dieser Reihe und kann es natürlich nicht erwarten, diesen Film endlich im Kino zu bewundern. I read “The Hobbit” then went to see the movie in 3D high definition and then read this movie guide. Everything is “hobbit” in my life at the moment and I love it. This movie guide took me by surprise with how exceptional it was, an unexpected treasure. It was incredibly insightful and informative. It was loaded with behind-the-scenes details including photos, concept art, sketches, actors in and out of character, interviews with not only the lead cast but with the directors, production crew, movement choreographer, costume designer, make-up and hair designers, and so on. It delved into the depth of each individual character telling bits about them. For example, Fili is the nephew of Thorin and should anything happen to Thorin then he is next in line for the throne. Seeing their costumes up-close was fantastic to see such exquisite designs and oh so many varieties of facial hair—who knew there were that many. Such eccentric Dwarf hairdos. It all made them come to life. I was captivated by the section “Arming the Dwarves” where their weapons were displayed and explained. It distinguishes their characters even further. My favorite weapon of choice—knuckle-duster’s! The actor playing him said “I have a pair of knuckle-dusters. I mentioned that I saw Dwalin as the kind of guy whose hands are as much of a weapon as his hammer. So if he ever finds himself with no weapons, he still has his hands.” Dwalin is quickly becoming my favorite dwarf—he’s formidable. I love his fierce look brandishing a bald tattooed head and hands. The actor said “To me, the tattoos on my hands, arms and head are a pictorial history of our people, rites of passage, tokens commemorating what has happened to the Dwarven race.” Cool right? That’s not all…he carries two axes: “Grasper” and “Keeper.” I know!!! I would not want to get on his bad side. I was shocked that I hadn’t noticed how many weapons some of them carry. In an extreme case Fili “has practically everything, including the kitchen sink, attached to his body.” Now I have a better grasp altogether on telling the 13 dwarves apart. I have to watch the movie again with my growing appreciation for how much work went into this film. Das offizielle Filmbuch von "Der Hobbit - Eine unerwartete Reise“ befördert von Anfang an den Tolkien-Fan in eine fantastische Welt hinein. In eine Welt, die voller Technologie, Kreativität und Arbeitsaufwand steckt und von einem Mann geleitet wird: von Peter Jackson, dem Mann, dem wir bereits die großartige „Herr der Ringe“-Trilogie zu verdanken haben. Schon sobald man die erste Seite aufschlägt, ist es so als wäre man selbst am Set mit dabei. Man lernt nicht nur Bilbo Beutlin kennen, sondern auch die 13 Zwerge, ihre Kostüme, ihre Requisiten und ihre Geschichten. Jeder Charakter bekommt mindestens zwei Seiten oder mehr, auf denen in einem einfachen Schreibstil zuerst die Figur erklärt wird, und dann diese durch Aussagen der Schauspieler erläutert wird. Und diese schwanken oftmals zwischen witzig und skurril, und oft hat man dabei auch etwas zu lachen. So erscheinen einem die Figuren aus Tolkiens Welt noch viel lebendiger, als man sie bereits auf der Leinwand oder im Buch erlebt hat. Durch das Lesen dieses Buches bin ich den vielen tollen Figuren, die Tolkien erschaffen hat, fühle ich mich der Welt von Bilbo Beutlin und seiner Zwergenbande noch viel näher als vorher. Man ist nahezu berauscht und verspürt wahre Glücksgefühle, denn mit einigen der ausführlich beschriebenen Charaktere konnte ich mich oft identifizieren. Ja, die Zwerge und Hobbits sind mir wirklich ans Herz gewachsen, und gerade dieses Buch ist wirklich fantastisch gestaltet: nicht zu viel und nicht zu wenig, sondern genau richtig, mit vielen tollen Bildern versehen und Zeichnungen und Interviews und noch vielem mehr ausgestattet. Ich habe die Welt um JRR Tolkiens kleine Völker richtig lieb gewonnen und kann es kaum erwarten, mir die BluRay zu besorgen. Und manchmal, ja manchmal, da wünschte ich selbst, ich wäre ein Hobbit, der in der Erde lebt… im schönen Beutelsend natürlich. Being a huge fan of The Hobbit and Lord of the Rings, when I saw this on Amazon while looking for something else, I knew I had to have it. The Movie Guide has interviews with all of the actors and just about all of the key members of the production crew along with many behind the scenes images from The Hobbit. These two make an excellent combination because the images are generally very good and so are the interviews. The tone of the writing is warm and enthusiastic which will appeal to fans of The Hobbit. I was impressed by how thoughtful many of the actors' comments were and how the author showed both their excitement and interest for the movie and even some of their insecurities. I also think the interviews with Peter Jackson are excellent and show his reluctance to take this movie on in an honest and relatable way. For me the biggest revelation of this book was marveling at some of the beautiful sets from the movie and appreciating those for quite possibly the first time. The people who are able to create such real looking sets have incredible talent. My only real complaint about the Official Movie Guide is that the larger images (two page spreads) are blurry which is a real shame considering how beautiful many of the images would be. Any fans of The Hobbit will really enjoy this book and I know I will gladly display it on my bookshelf. People who want to know more about how movies are made will find some interesting sections in here even if this isn't quite a must purchase. 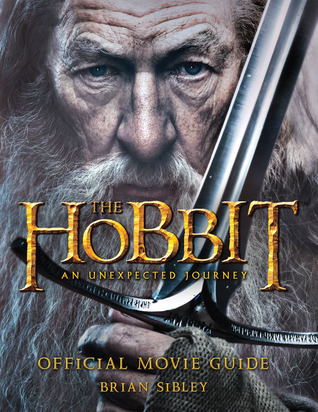 "The Hobbit: An Unexpected Journey" by Brian Sibley is the official movie guide to the 2012 movie of the same name based off of J.R.R. Tolkien's "The Hobbit." Full of beautiful artwork, set pictures, costuming, and cast and crew interviews, this movie guide takes the reader through the process of creating a theatrical movie.This was a nice little gateway into experiencing more of Middle Earth that I so enjoy. I've always appreciated the visuals of "The Lord of the Rings" and "The Hobbit," so I always look forward to these official movie guides. What I especially enjoy reading about (as well as looking at the gorgeous photos) are the sections that talk about costuming and props. And as always, I love reading the cast interviews and the interviews with director Peter Jackson.Really enjoyed reading this. Only took me two days to get through. Great photos and interviews. It was especially fascinating to read the interviews with all the Dwarven characters and how they created backstories for their characters, even though those backstories never made it into the film. But it's still nice to know how much the actors really got under the skin of their characters. And ladies: Richard Armitage, Aidan Turner, Dean O'Gorman, and Martin Freeman. What's not to love? The book, "The Hobbit" by J.R.Tolkien was an amazing "journey" because I'm a huge fan of Lord of the Rings and The Hobbit trilogy I just like the way how it all relates to the plot and history. But now to the book, I enjoyed the book because it made me experience the adventure and the plot also. In addition, I liked the way how it describes the setting, characters, and plot, then as my favorite character is "Thorin" because it teaches me to be leader, but when Thorin was taking too much of the "spotlight" he had to go with Bilbo Baggins' plan(The main character in the book, such as, Gandalf the Grey. Gandalf the White from the Lord of the Rings.) Finally, this book is very special to me(also for Lord of the Rings) because I grew up with it. I suggest this book for people, who like fantasy, adventures, and action. Also, the people who enjoy J.R.R Tolkien books I encourage the readers to read the trilogy of The Hobbit and Lord of the Rings. Great look at how the first of The Hobbit films was made. I liked getting a glimpse at the behind the scenes of the movie and seeing how the personality of each dwarf was developed (which I didn't necessarily notice in the film on my first viewing). Brian Sibley also settles some fan debates: Ori is the youngest and yes, that is bird poop in Radagast's hair. However, I did feel that some details (such as the huge delays in getting the project greenlit) were glossed over. It also felt out of date in parts - there was no hint of The Hobbit being a trilogy, only the originally announced two films. Also, being somewhat of an Elf fangirl I was disappointed by the lack of Thranduil, though I was pleased to see Galadriel and Elrond represented. No sé que me pasa con las guías oficiales de las películas del Señor de los Anillos, pero me encantan. Otra vez, como con la guía de iniciados de divergente, la leí en un arrebato en la librería y me e n c a n t ó. Igual no tanto como para gastame 40€, pero sí que la disfruté. Las entrevistas con Peter Jackson son simplemente geniales, y lo bien que se habla de Martin Freeman es alucinante, como buena fan lo apoyo hasta la muerte. En fin, es entretenida y con muchas cosillas interesantes, si os gusta El Hobbit, muy recomendada. 12/8/13: Thought I'd finally buy this a year later as movie #2 is about to be released...and when I could get it new, for under $4. Ordered it from Ebay today, so still waiting on it.12/30/13: Most, if not all, of this information can be found, and explored in more depth, on the extended blu-ray edition of The Hobbit: An Unexpected Journey. But it's nice to be able to explore behind the scenes in convienient dribbles and look at the artwork and photo stills. Considering the low price of this book at this point in time, there's no reason for fans not to buy it. Recomended. There have been a few movie guides over the years that have disappointed me, but this wasn’t one of them. It was PACKED with hundreds of full-color photos on glossy pages, and filled in with plenty of text to explain them all. There were interesting facts to be learned about everything. Each dwarf got a full spread to himself…and then there were sections about weapons and makeup and locations. Wizards and hobbits and dwarves. Clothes and casting and high definition. And, of course, Gollum and goblins and wargs. And SO much more! This is a must-have companion for any HAUJ fan. Not a comprehensive making-of, but still an excellent read, full of interviews with the cast and crew, and lots of photos. A light book, but perfect for building my anticipation for the movie.The best parts of the book were the interviews with all 13 dwarf actors, explaining their characters and costumes and weapons. It's amazing to see how much work was put into really characterising the dwarves. They all seem like they will be three-dimensional characters with their own character-arcs and idiosyncracies; not just Gimli-clones. The perfect book for any fans of Peter Jackson's first Hobbit film, which fortunately I am. Brian Sibley has gone to great lengths to gather as much information about the production as possible, including multiple interviews with the cast and crew. It's the technical achievements that are truly awe inspiring about the films, and the guide also shines the spotlight on people that work very hard but hardly ever get recognised, I take my hat off to all of them (not that I wear one).So if you are a fan give it a read, you won't be disappointed. Just the right mixture of information. From cast and crew in-jokes to nuggets of technical film-making wisdom, this book covers it all. The main focus is on each of the 16 (?) main characters from the point of view of the actors as well as the costume dept, make-up, prosthetics, casting, directors, art dept, digital effects etc! It's left me with a burning desire to rewatch the film. I really hope the commentaries on 'The Hobbit' DVD are as enthralling as those on the original 'Rings' trilogy. This is a great companion book for the film, with information on various aspects of production and lots of great photos and images. It follows the whole creative process from the acquirement of rights to the film, right down to the making of wigs and Hobbit feet, and you get to hear from producers, actors and backstage crew alike.I can highly recommend this book for fans of the film(s) and those interested in the film-making process. Brian Sibley - Brian Sibley is an English author who has written over 100 hours of radio drama and has written and presented hundreds of radio documentaries, features and weekly programmes.In 1981, he co-wrote BBC Radio 4's adaptation of Tolkien's The Lord of the Rings with Michael Bakewell, and has also adapted C. S. Lewis's The Chronicles of Narnia and Mervyn Peake's Gormenghast for Radio 4, for which he received a Sony Radio Award in 1985.As a broadcaster, he was a contributor to and then regular presenter of the former BBC Radio 4 arts programme Kaleidoscope and the BBC World Service arts magazine, Meridian. He also presented the Radio 4 film programme, Talking Pictures and chaired the radio panel games Break A Leg and Screen Test, and presented several seasons of the BBC television programme, First Light.The Daily Telegraph radio critic, Gillian Reynolds gave him the accolade "magician of the airwaves".